Will Peterborough United star Gwion be good to go? Gwion Edwards celebrates a Posh goal at Northampton last season. Peterborough United could be persuaded to sell star midfielder Gwion Edwards. Posh director of football Barry Fry has revealed Edwards might not agree to extend his current ABAX Stadium deal which expires at the end of next season. Idris Kanu has been linked with a move to Port Vale. If that remains the case Posh would stand to lose a top player for nothing. Championship clubs have been showing an interest in the 25 year-old midfielder while the Posh management consider their next move. “We want to talk to Gwion about a new deal,” Fry stated. “Obviously we want him to stay as he’s a top player, but at the moment his agent is being stubborn and talks haven’t started yet. “The manager wants to keep him at all costs because he rates him so highly and because he’s not convinced we will get much of a fee for someone who hasn’t been able to play that much for us anyway. Brad Inman could return to Rochdale next season. Edwards has started 48 of Posh’s 92 League One fixtures in his two seasons at the club. 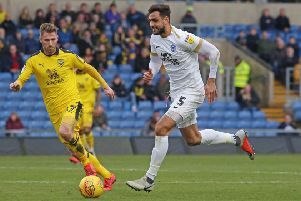 Posh have a similar ongoing situation with left-back Andrew Hughes with Preston North End keen on taking the 26 year-old to Deepdale. Meanwhile teenage striker Idris Kanu has been linked with a loan move to League Two side Port Vale, but fellow Posh forward Ricky Miller’s proposed transfer to the same club appears to have fallen through. Posh have turned down a bid from a Championship club for centre-back Jack Baldwin as well as bids for attacking midfielder Danny Lloyd from clubs in Leagues One and Two. Baldwin is on the transfer list, but Lloyd isn’t. League One rivals Rochdale have shown an interest in Posh midfielder Brad Inman who spent last season on loan at Spotland.